Parent-child power struggles over housework, behaviour and daily tasks, be gone! It’s the handy reward chart to the rescue. When my toddler was learning to use the toilet, I created my own reward chart. I really didn’t think it would work, but lo and behold my little man loved it, and toilet training was a breeze. I can’t conclusively say it was due to the reward chart, but I do believe having something to get excited about every time he used the toilet gave him a nudge in the right direction. These lovely charts are the next step in reward charts – they’re about creating habits and behaviours to help steer your child through their early years. The Elfie Love Goal and Reward Charts were created by Melbourne mum and entrepreneur Kylie Appel. They come in three packs and can be tailored to suit your child. My son is now three-and-a-half and we trialled the My Amazing Day Goal and Reward Chart Pack. What I liked about this pack is that it encourages independence in younger children. I’ll admit that I often just do things for my son, rather then let him try. The chart comes with stickers already printed with goals, for example: help tidy up, help set the table and dress myself. The rewards include simple pleasures like a family movie night or picnic. There are also blank stickers so you can create your own goals and rewards. The packs also come with a sheet of stickers to be used when the child has completed a goal. Ten stickers are needed before the child has successfully achieved a goal. My son loved picking his own stickers – particularly choosing what his rewards would be. The packs also include a reward certificate. The other packs are suited to children a little older, but the charts are marketed as suitable for children of all ages. 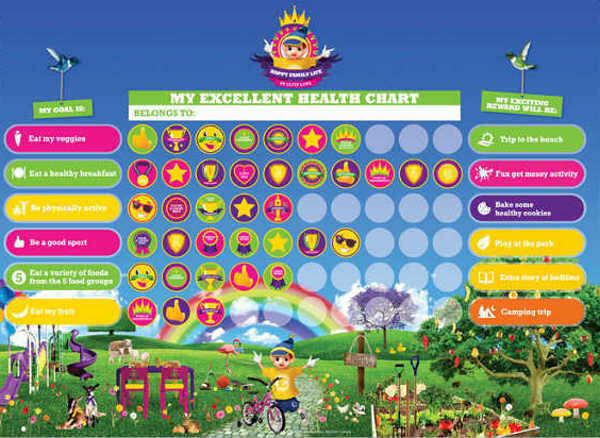 The My Excellent Health pack focuses on getting kids to eat well and take care of their bodies. 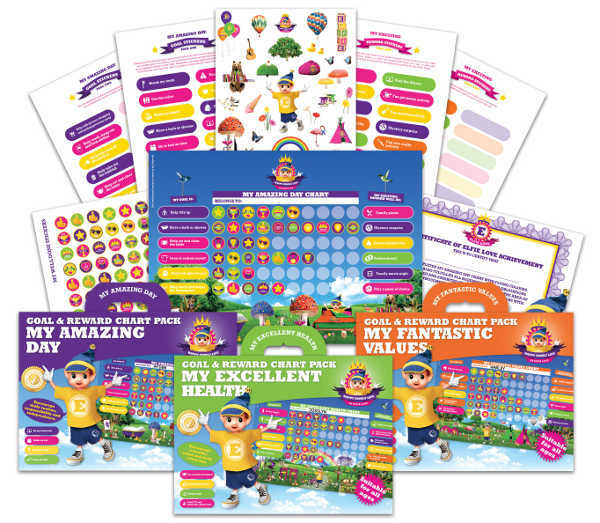 The My Fantastic Values pack encourages kind, caring and respectful behaviour. What I love about these packs is they help parents to focus on good, positive behaviour. Often as parents we find ourselves only giving attention to bad behaviour, so it’s great to have a reminder to acknowledge good behaviour. The charts are based around a cute little fellow – Elfie Love, and the packs come with some Elfie stickers as well (we all know how much kids love stickers!). The Elfie Love charts are available through Elfie Love, and cost $19.95 each.